It's unusual for me to review the same book twice. As a matter of fact, this is probably the first time that I have done it. 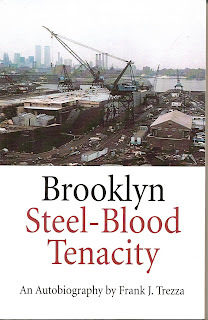 But Mr. Trezza was raised on East 17th Street between Avenue S and T in Brooklyn. I was raised on Avenue R between East 13th and 14th Streets. We both used to eat the Italian bread on the way home from the bakery, while it was still warm and soft. We played in the same streets. So, you see, I've got to give this book another shout out! It is seemingly short, being less than 200 pages, but packs a wallop that will stay with you even after you have finished reading. It is the story of a young man searching for a vocation and finding it in the shipyards, and later working aboard foreign ships. Mr. Trezza and I have both walked the same streets and made some of the same journeys in our lives. That we should come to meet through this blog fascinates me no end. The book is at once the story of the early 1970's and making career choices, as well as the story of the implosion of the American shipbuilding trade through the abuses of both the politicians and the Unions themselves. It is also the story of a working man, striving in changing times, to keep pace with it all. "The U.S. vs. John Lennon"